MSM is a naturally occurring sulphur compound found particularly in joints, tendons, ligaments, bones, and skin where concentrations should ideally be high. Bamboo (Bambusa vulgaris) is a natural and non – animal source of 'Glucosamine – like' compounds. These compounds are the precursors (building blocks) of the complex muco – polysaccharides that provide the structural components of connective tissue such as bone, tendon, cartilage and ligaments. 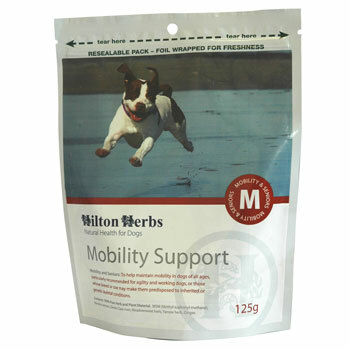 Generous quantities of Devils Claw, Meadowsweet, Yarrow and Ginger are then added to support the dogs cardio - vascular and musculo – skeletal systems to help support joint suppleness, and ensure that they maintain optimum mobility whatever the activity or age. 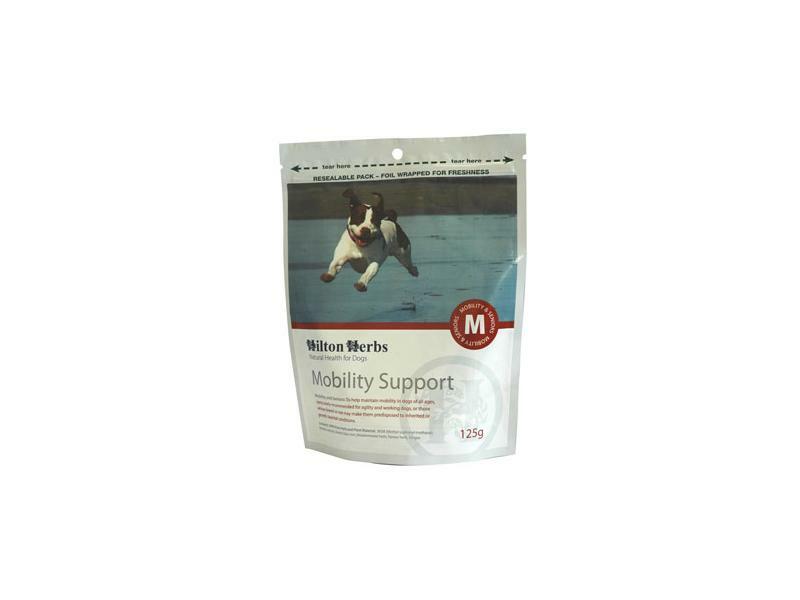 Mobility support is recommended for dogs of all ages..
MSM (Methyl – sulphonyl – methane), Bamboo Extract, Devils Claw root, Meadowsweet herb, Yarrow herb, Ginger. Below are some recent questions we've received regarding Hilton Herbs Canine Mobility Support, including answers from our team. It is OK to give this herbal supplement along with the veterinary diet. If it helps then fine and you should continue. Otherwise I would ask your vet if a prescription drug might be appropriate. (If you try a prescription product for 2 or 3 weeks, then stop again, it is often then very clear how much benefit the medicine provided. If that is considerable, then it is usually worth going down that route. If it did not make much difference, it is not needed and a supplement might well achieve a mild but fully adequate beneficial effect.